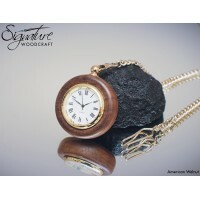 Our range of skilfully handcrafted wooden pocket watches and wooden clocks. Our products are hand made in our workshop in County Antrim, Northern Ireland, using both local and exotic woods. Bring back some nostalgia with our handmade, crafted Pocket Watch series! This pocket watch fe..